Sujit Banerjee's Rukhsat - The Departure is the book I read recently. And I must say, it is an amazing collection of stories. I received this book from the debutante author himself. 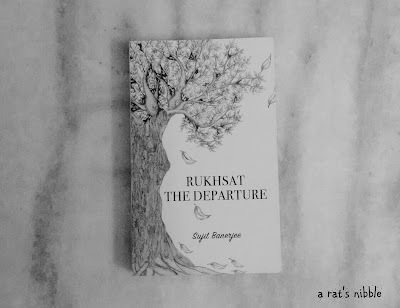 Rukhsat - The Departure - Intriguing stories of 26 myriad characters where each one leaves an indelible mark. I was not aware that this anthology of short stories would interest me this much when I picked this at first but it proved me wrong. It gave me a chance to read about some untold stories in a neat narration. And I completed it within a day. First of all, I loved the cover page. It is simple and apt for the title itself. With neat presentation in his debut book, the author really did a commendable job. Sujit Banerjee, a Bengali, who finished his post graduate in Psychology. Even though he claims to be not a great psychologist, I think that base helps him in writing this book which deals with dark side of the human mind. Twenty six alphabets, twenty six names, twenty six short stories. Each story explores unique emotions which takes you into the darkest recess of mind. It is like getting to know their secrets. Every story is an episode in their life. Some frothy, some painful, some might look weird while most of them are dark. But all of them are intriguing. Sujit dug deep into each character's lives and explored their untold side which he carved them into some wonderful stories. I loved the way the author perceived each characters. They are all well etched and their thought process are very well told. This book introduces us to 26 different characters. Some characters are likable. Some are not. Either you'll like them or hate them but you can't just ignore them. Because they portray uniqueness in their voices which is quite engaging. The smooth flow in his writing made me glued to the book. It was like I am listening to each character. I also felt like connecting with some of them. To begin with, Abhimanyu who is still unborn talks about his world inside the womb. Farzana talks about her weird sexual desires while Gustav longs about his one night stand love. If Hemakshi dwells on her empty womb, Lokita survives this harsh world to buy her family a home. If Yasmin's story ends in a sad way, Zayan reminisces how he ended up there while he was dying. Also there are few other characters who touched me. From birth to death, this book covers diverse feelings. The language is good and it's catchy sometimes especially when sentences are short. Some stories are interconnected. The same story told in 2 perspectives makes it interesting. Some left me speechless, some made me ponder and some disappointed me. Some stories have twists in the end and it leaves you in a state of wonder. And that is something I always enjoy in a story. Kudos to the author to present such a book at his debut. It is really appreciable. I am not sure if many like this genre but to me, it stands out among the regular fiction. Rukhsat - The Departure is an engrossing read where in the end, the stories leave you to make your own judgment. As a gift for my readers, I have 3 books for the giveaway. If you are interested, you can contact me at ratnibbles@gmail.com. Thank you for your review - you are kind and generous! Your review assures that i rightly judged the book by its cover! Meera, the book looks intriguing and your review did the charm. Would love to read this short stories by another psychology follower.